The night-watchman concept in Test cricket is a paradox. A batsman of far lesser ability is sent to bat in place of a far more accomplished batsman, in possibly inferior batting conditions. The idea is to protect the next recognized batsman for the next day’s play, rather than run the risk of losing another batsman on that same evening. Test cricket has witnessed many stubborn innings from these men who act as a shield. Here’s a look at the highest scores by a night-watchman in Tests. At the Lord’s in 1988 the England wicketkeeper-batsman made 94 against Sri Lanka in his team’s first innings in reply to 194/10 posted by the visitors. Jack Russell came into bat on day 1 of the match. The home team scored 429 in its first innings and eventually won the one-off Test by 7 wickets. In the final Test against Australia in 1982-83, which England had to win to retain the Ashes, they were set an unlikely 460 and lost Geoff Cook in the first over of the three they faced on the fourth evening. Hemmings saw out the day, and then resumed the next morning. He had effectively saved the match and, briefly, raised hopes of a dramatic win for England as the team finished the match scoring 314/7. Harold Larwood’s pivotal role in the Bodyline series of 1932-33 is well documented, but in the final Test at Sydney, he was sent in as night-watchman and made 98 in two-and-a-quarter hours. Larwood, the villain of the series, was cheered at the middle by the Australian crowd. But his delight was short-lived. He broke down in Australia’s second innings and never played for England again. His team, though, won the match and took the controversial series 4-1. At Edgbaston in 1999, during an extraordinary home debut against New Zealand, Alex Tudor’s 32 not out in the first innings had saved England from humiliation at 45 for 7, and then, second-time around, he scored 99* of the finest night-watchman runs ever scored, as England made easy work of what should have been a challenging run-chase of 208. The home team thus took a lead of 1-0 in the 4-match series. Nasim-ul-Ghani was the youngest Test cricketer at the time when he made his debut in 1958 against West Indies, at only 16. He became the first night-watchman to score a century when he hit 101 against England at Lord’s in 1962 in the second match of the series. This was his only century in Test cricket, and it was also the first century by a Pakistani in England. The home team, though, won the Test and took a 2-0 lead in the 5-match series. India had lost Sunil Gavaskar late on day one of the sixth Test against Australia in Mumbai in 1979. The great wicketkeeper batsman Syed Kirmani was sent in to bat and he held on as India finished the day on 231/3. The next day, he worked his way to his first Test ton, scoring 101*. India won the match by an innings and 100 runs and also the series by 2-0. Leg-spinner Tony Mann was 32 when picked for an Australian side decimated by defections to World Series Cricket. He did little with the ball but in his second Test, he scored 105 after going in at number 3 to set up a two-wicket win for Australia who had been set a target of 342 by India at Perth in 1977. The home team took a 2-0 lead in the 5-match series, however, the visitors fought back splendidly to level it 2-2 before the final Test at Adelaide. India fell short by just 47 in that match chasing a target of 493 as the Aussies took this remarkable series 3-2. South Africa’s gutsy wicketkeeper batsman had a long and distinguished career for his country. In Durban during the 1999-2000 season, he scored a brilliant 108 coming into bat late on day 4. His team was asked to follow-on after being bowled out for 156 in reply to England’s first innings total of 366/9. Boucher’s knock helped the home team save the match and keep the 1-0 lead intact in the 5-match series. In November 1999 at Harare against Zimbabwe, Boucher scored 125 after being sent ahead of Jonty Rhodes in South Africa’s first innings. Batting first the home team was bundled out for 102 and in reply, the visitors made 462/9. Zimbabwe scored a paltry 141 in the second innings and lost the first Test. The final Test witnessed a similar drubbing as the Proteas took the series 2-0. 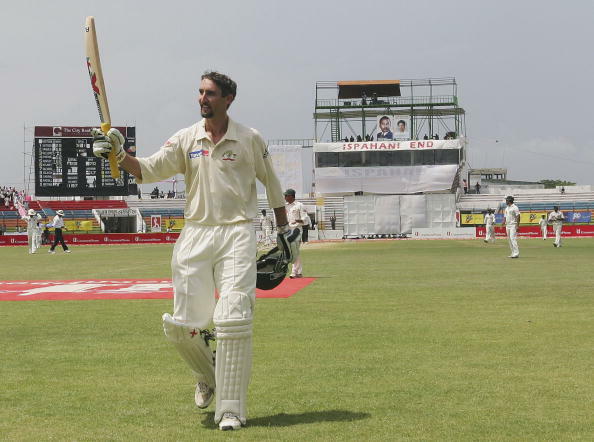 An incredible double century by Jason Gillespie propelled the tourists towards a mountainous lead and a series whitewash over Bangladesh at Chittagong in 2006. He came into bat on day 2 and played a remarkable knock as the Aussies posted 581/4 in reply to the home team’s 197. Australia eventually won the match by an innings and 80 runs and took the series 2-0.